The Preservation Alliance of Minnesota invites you to join photography and architecture enthusiasts for an evening stroll around downtown Northfield on August 23 from 5:30-7:30pm. Beginning and ending at the Northfield Arts Guild, the Northfield Mobile Photography Tours pairs art and photography with local history. We’ll begin with a mobile photography lesson from Eric Mueller. Eric will share tips for maximizing your phone to take amazing pictures on this tour and future excursions. Eric is a Minneapolis-based artist, photographer, and teacher. Known for his graphic style and strength in composition, his photographs have been exhibited in dozens of group shows, including at the Plains Art Museum, the Midwest Center for Photography, Head On Photo Festival, and the Columbus Museum of Art. Eric teaches iPhone Photography classes online for iPhonePhotographySchool.com and locally for FilmNorth (formerly IFP Minnesota), the Minnetonka Center for the Arts, and the Preservation Alliance of Minnesota. He has about 50,000 followers on Instagram. 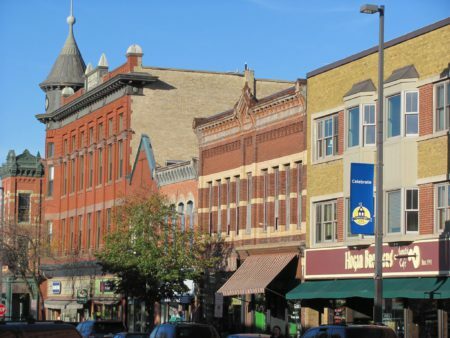 Then, we’ll explore downtown with Barbara Evans, a Northfield resident, teacher, and old home owner & restorer. Barbara taught American Literature, Drama, Debate, and Composition in Rochester, MN for 34 years before retiring and moving to Northfield. She has been a visiting professor at St. Olaf College. Barbara’s interests include architecture, travel, photography, and renovation of her Arts & Crafts home in Northfield. She sits on the Northfield Heritage Preservation Commission and enjoys learning about Northfield’s historic buildings and homes. Barbara also has a small greeting card company that features her photography: Cannon Shots.